Foreign currency trading is now a very dynamic business. The incredible numbers and scales are currency exchange for multibillion-dollar amount of the foreign exchange market every day around the world. The foreign exchange market is so globalized that it already includes not only central banks but the largest investment companies, mutual funds, large hedge funds, and also ordinary forex brokers and forex traders. Significant volume of foreign exchange transactions accounted for the interbank market where transactions take place through electronic transfers. A large share of foreign currency trading accounted for by such banks. Now banks act as the forex market operators for customers, which allows speculation on the trading floors. The bank's profit is the difference between the Ask and Bid. For speculators on the forex market can be ranked the private equity hedge funds that speculate in various assets and currency pairs using leverage. They carefully select the State problems using of macroeconomic analysis, and make decisions about the opening of trading positions on the market, relying on its experience. Thanks to aggressive behavior on the market and a large volume of such transactions, funds have a dynamic impact on the nature of the foreign exchange market operations worldwide. With the help of brokers, speculators and small investors may enter into transactions on the market, with the purpose to profit from speculation on changes in currency exchange rates. Such trades are held by traders on their own equity. 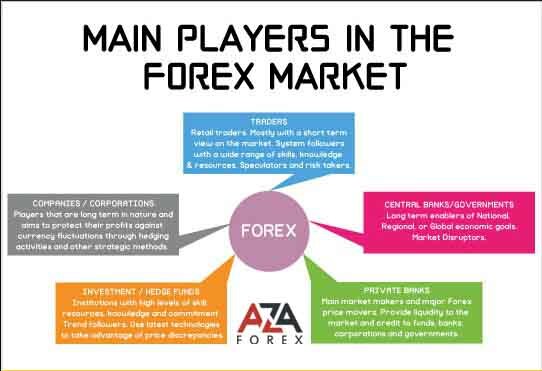 The mediators between the retail market and the interbank are forex brokers, traders, providing maintenance services and currency exchange operations, providers of trading platform, through which players make profits in the forex market.